The Hyundai i20 Automatic is a great choice if you're after a solidly built, well equipped and good-value hatchback and you prefer automatic transmission setups. This is the supermini you need to consider for family transportation or carpooling needs. The Hyundai i20 Automatic is one of our most popular supermini models thanks to its safety features, advanced comfort design interior, amazing power and drive, and the customization packages that are available. and it is easy to see why everyone is falling in love with the newest model from Hyundai. Check it out for yourself and see how perfectly elegance and usability can blend into one amazing vehicle. 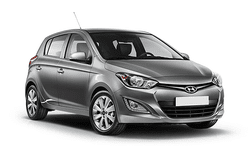 Get a Hyundai i20 Automatic now by giving us a call!